Knew nothing about these until this thread popped up yesterday and now will get one very soon. I know how big a fan of wings you are, and you will not be disappointed. I didn't go crazy, I got the 4 Qt Ninja. Its not the monstrosity that is an air fryer, pressure cooker, blender & clothes dryer, but its still bigger than a lot of the ones I've seen. I had 18 wings in it Saturday night with some room to spare, and I've had 12 frozen giant Walmart wings in there at once before, as well. The only thing with filling it up is you've gotta move stuff around more frequently so the ones closest to the burner don't get overcooked. You just cleared up my biggest question regarding which size to get. The 4 quart sounds like about the size I would probably want. If just for me, could go with something smaller but my daughter always wants wings too when I fix them. 18 is what I usually cook for her and I and would be a pain to to cook in two different servings. Had fried rice last night. It was awesome. required a lot of stirring to keep from crisping, but man it came out perfect. Love my air fryer. We've basically treated it as an alternative to the deep fryer or ovem. French fries, chicken, wings, all success stories. Pork chops are next. Did you use foil or a pan of some sort to keep the rice falling to the bottom? Not sure what the advantage of frying without oil is. Anyone? 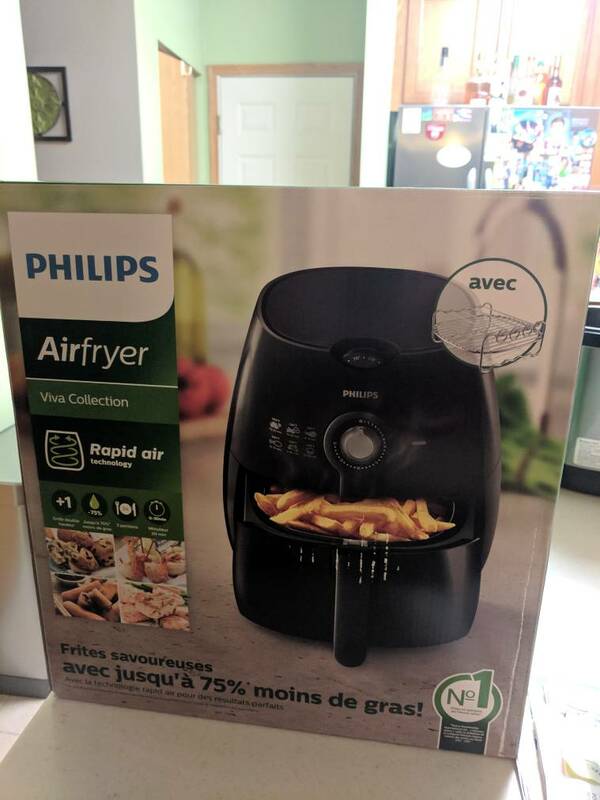 Being new to the air-fryer I am still trying to find an answer to that question. So far, in my experimentation it seems like the only thing I have accomplished by cooking with hot air and no oil. is to dry everything out. I suppose that's good if you're making potato chips in it. That's exactly it. It's not frying, but supposed to mimic it. French fries come out crunchy but not oily and much healthier. Pork chops come out juicy as heck. There's tons of advantages, mostly brought on by health consciousness. You have to cook the right things. Look up recipes online, it helps a ton. My wife uses Pintrest, it has tons of insanely yummy stuff on there. Between the air fryer and our instant pot, we are pretty much to a point where we only use the oven a couple times a month. It's great. I just made Chinese pot stickers in my air-fryer. They turned out really well. I spritzed them with oil and cooked them for 8 1/2 mins. at 400 degrees. I turned them over at the half way point. Since this air-fryer, oil less cooking is a new way of cooking, it's going to take some practice to get it right. That's exactly it. It's not frying, but supposed to mimic it. French fries come out crunchy but not oily and much healthier. Pork chops come out juicy as heck. There's tons of advantages, mostly brought on by health consciousness. You have to cook the right things. Look up recipes online, it helps a ton. My wife uses Pintrest, it has tons of insanely yummy stuff on there. Between the air fryer and our instant pot, we are pretty much to a point where we only use the oven a couple times a month. It's great. The thing is, I have been following the recipes from Pinterest. But I will say tonites pot-stickers turned out really well in it. I got pro xl from the TV ad did not like it that well, then got nuwave brio and love it. I have cooked pork chops, fillet mignot, chicken breast, sweet potato fries, beets, broccoli etc in it. All has been very good. Last edited by sposey013168; 01-14-2019 at 08:47 PM. I have cooked prick chops, . I asked for advantages, not disadvantages. Oil is fat. Fat is good.